The ultimate kids toy, Switch & Go Dinos easily transform between a dinosaur and a vehicle in a few simple steps. Switch & Go Dinos come equipped with an LCD screen for customizable animations, providing an imaginative and stimulating 2-in-1 play experience. In dinosaur mode, action buttons play interesting facts about each dinosaur, providing kids with fun and enriching playtime. 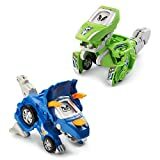 Sliver the T-Rex is a 2-in-1 toy that easily transforms from a dinosaur to a vehicle and back again. Sliver’s LCD screen displays cool customizable dinosaur eyes and driver animations. Press his buttons to learn dinosaur facts and hear realistic dinosaur and vehicle sound effects. Plays 50+ wild sounds and phrases. Horns the Triceratops is a 2-in-1 toy that easily transforms from a dinosaur to a vehicle and back again. Horn’s LCD screen displays cool customizable dinosaur eyes and driver animations. Press his buttons to learn dinosaur facts and hear realistic dinosaur and vehicle sound effects. Plays 50+ wild sounds and phrases. Operates with 2 included AAA batteries. For even more exciting action, choose from the other VTech Switch & Go Dinos crew members and find them a friend. Kids love toys that can transform from one toy into a different one – and they especially love dinosaurs and vehicles. When you combine the two, that’s a winning combination that your kids will spend a lot of time playing with. The line of VTech Switch & Go Dinos are super fun toys that give kids the ability to play with the toys as cars or jets or trucks and yet can morph into fearsome dinosaurs. These 2-in-1 toys change in seconds – and easily too – even a toddler can change these toys from one mode to the next. These switch and go toys have a huge selection of sound effects and graphics that range from words to roars. The amount of choices will depend on the model you choose to buy, but some of them have more than 70 built-in noises or sayings. There are several different models you can choose from in this line and each of them have unique aspects that quickly make them a favorite toy. For example, one of the toys looks like a car carrier at first glance, but with a few twists, the toy becomes a dinosaur. What’s so cool too about this line of toys is all of the different imaginative play options your child can adopt. When your child is playing with the one that looks like a car carrier, other VTech Switch & Go Dinos can be carried on the toy. Not only that, but the carrier can fling the pterodactyl on the extra car and make it go airborne – and kids love that! The LCD screen that’s part of these toys serves a two-fold purpose. When the toy is in vehicle mode, the LCD screen has different modes that allows kids to choose the face or the features they want on the dinosaur or the driver. So even if you buy two of the same kind, because you have more than one child who wants one, they can make the toy unique for their play. Dinosaur trivia can also be displayed and the sounds that go with the toys make noises that are appropriate for the toys. For example, the fighter jet will make realistic plane sounds and can sense when the plane is held or waved in a flying motion and will adjust the sound accordingly. The fighter jet can perform rescues or launch food. When the jet is transformed into a dinosaur, the dinosaur can roar or snap his powerful jaws. At the press of a button in any of the models, your child can hear either the dinosaur or the human speaking. These toys are fun and affordable and you can start your child’s collection today.